Argus Heating design, manufacture, and distribute heavy duty water heaters. These specialist elements are well suited to difficult heating conditions or where extended element life is required. The large diameter legs allow for a low watt density resulting in reduced scale (lime) build-up, and lower element surface temperature as well as extending element life. Pressure tested to reduce the chance of leakage. ‍High quality components to maximise performance and extend the life of the element, using Incoloy® 800 sheaths with 11mm diameter. 1.25” or 2” BSP brass boss with M5 stud terminals. Thermostat tube fitted to 6kW WH6002-1 heater. Sealing washer and earthing screw. ‍Water in cylinders where an extended element life is required. 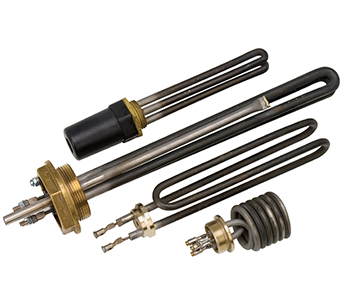 Argus Heating design and manufacture these specialist elements which are well suited to difficult heating conditions or where extended element life is required.